Earlier today I posted about the “limited edition” Marvel female superhero t-shirt being offered by the Disney Store. But there is one problem that a sharp eyed reader pointed out. The image of Kamal Khan is taken from the Art Adams variant for the first issue. 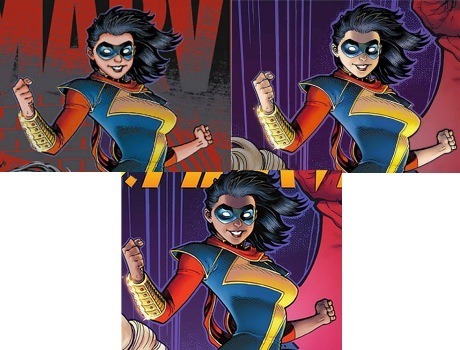 That cover was “tweaked” before publication because Kamala was a little, well, white. See below the original and the final version. The t-shirt uses the first one. Below see the shirt and the original cover with the final cover belwo. Given that it seems Disney is making these to order (hence the limited edition and 3-5 weeks for delivery they should be able to correct this before they go into production. It’s an easily understood mistake but one that should definitely be corrected. Delevingne’s comments about female superhero attire is a little head-scratching, though. While there are plenty of problems with female representation both in films and especially on movie merchandising, the accusation that they are “normally naked or in bikinis” seems a bit baseless. 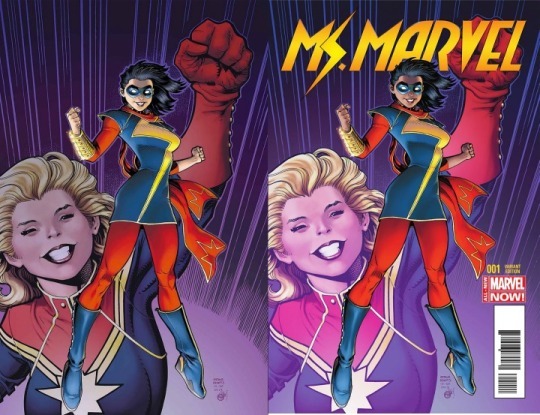 Even though Marvel sticks to a heavily skewed gender ratio and tends to put women heroes in impractical high heels and wedge boots as a default, their characters never wear bikinis; Black Widow, Peggy Carter, Maria Hill, Sif, Gamora and pretty much every other heroine in that universe always go into battle wearing pants. We’ve yet to see what Enchantress will be wearing in “Suicide Squad.” We have seen plenty of pics of the film’s version of Harley Quinn, who shows a bit more skin than many – or all – of her Marvel counterparts. With the explosion, both of the contractors NASA relies on to get critical food and supplies to the space station have now had explosions within eight months of each other. With the retirement of the space shuttle, NASA lost its ability to fly astronauts form U.S. soil, and has been paying the Russians more than $70 million a seat to fly American astronauts to the station. But NASA hopes to use contractors to end that dependence, and last year awarded contracts to SpaceX and Boeing to develop a capsules that can carry astronauts to the space station. Much of Covington’s influence on his followers comes from his novels, which are written in a style that reads like someone spilled a 50-gallon barrel of ethnic slurs all over a stack of early-draft Robert Heinlein novels. His choice of cultural icons dates his books considerably, even the recent ones, which are filled with up-to-the-minute references to Jane Fonda and Gilligan’s Island, but the author probably doesn’t care about these criticisms. The books are not primarily novels, anyway. The online payment company PayPal appeared on Saturday to have disabled the account of the Council of Conservative Citizens (CofCC), a rightwing organization that was cited in a manifesto linked to the South Carolina shooting suspect Dylann Roof and has given to prominent Republican politicians.